It's me. Do you remember me? I don't think in over six years I've ever been away for so long and I do miss you. As it happens, I'm still away and having an absolute blast, photo below. But first, you came to see my Twofer October cards, so here they are! 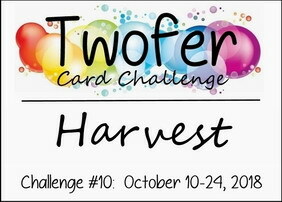 The prompt word this month is HARVEST! Wait. What? What the heck stamp do I use for harvest you might well ask. I know it is a bit general, but that can be a good thing because you have a lot of leeway this month as long as you use the same prompt word stamp or die on both cards. 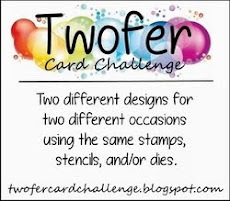 I used a bushel basket of apples and you'll see other wonderful examples from the talented Team and Guest Designers at the Twofer Card Challenge. Remember if you have any questions about the challenge or the prompt, you can contact me via email or the box on the side bar. The frame was made with a cover plate that has this pattern on one side and a woodgrain pattern on the other side. I believe it is from PTI, but I no longer see it on their website. The bushel basket is a wooden stamp from an OOB company. The apples and "Harvest" are from Technique Tuesday's "Fall" set. Here's a closeup of the apples which were both Hammified (winked) and glossified. Back to Basics and Beyond: Watercolors. Simon Says Work It Wednesday: Favorite stamping technique: watercoloring. For my second design, I used the same bushel basket but switched up my red apples for green ones and changed my design. The pretty rainbow plaid paper was die-cut from an MFT "Stitched Strips" die. The NBUS sediment from Altenew was die cut from white and purple fun foam and stacked. It's so interesting how the red apple photograph shows off the gloss better, while the green apple photograph shows off the winking better. It's all good, lots of schparkle either way you look at them! 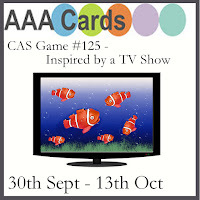 AAA Cards: Inspired by a TV show. "Green Acres." I had a special time with two of my sisters for a week in Iowa and now I'm over in Wisconsin enjoying a crafty week on a lake! Here I am with card-making sisters from Wisconsin, Michigan, and France! Top Row: Sue of Sue's Stamping Station and Kara of Bright Hope Creations. Middle Row: Me; Bobby of Bits & Pieces; Michele of I Card Everyone; Marcia of Marcia's Stampin' Pad; and Bev of Happy Dance. Bottom Row: Kelly of Notable Nest; and Anita of My Papercraft World. As always, everyone is just as you would expect them to be: warm, friendly, and loads of fun! What a blessing and a pleasure to meet them! Beautiful and so different from each other! This is going to a tough one for me, since I normally. shy away from autumn and harvest themed cards. But that's part of the challenge, isn't it? Love your pretty bushel with apple cards and I'm a little envious of your wonderful get-together with so many sweet and lovely kindred spirits. Enjoy and cherish the time you spend together! Fabulous cards Darnell and it looks sounds like you're having a great crafty time. Lovely photo of the ladies. Wonderful harvest cards. but that photo of all you beautiful ladies stole the post. So happy you were able to get together! Cute cards! Looks like you are having a blast with friends! I don't know who schparkles more - you and the gang or the apples. ;) It was fun meeting all of you and now for the fun of the Twofer challenge. I'm off to see what harvest stamps I have. Oh Darnell, I wish I could have attended this marvelous reunion, it would have been a thrill to meet all of you amazing women, whom I feel I know almost personally, through your fabulous blogs. If you have another reunion next year, I'll be there, this is way to much fun to miss. Now, to the TWOFER CHALLENGE..... I love the prompt word, it's a perfect time to make some fabulous Harvest time cards for the quickly approaching Thanksgiving Holiday. 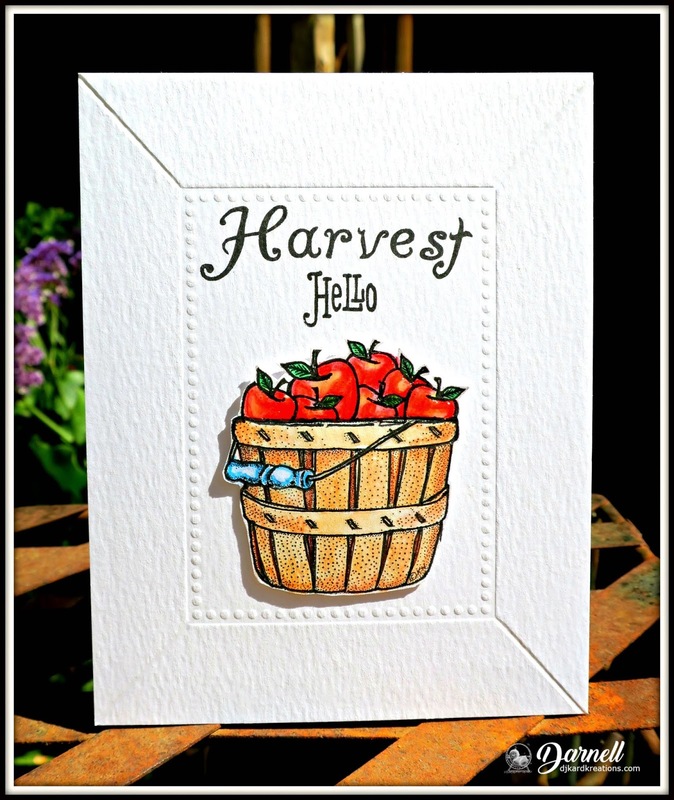 What a beautiful pair of cards my dear, love the way you framed the yummy bushel of red apples on this deliciously CAS Harvest card and your second card is colorful and bright, both the sentiment and this other beautiful bushel of green apples is a feast to the eyes. Gorgeous cards Darnell, thank you for sharing and I'll see you in the gallery. PS. I absolutely LOVE the picture of all of you gorgeous ladies. Love the bushel of apples. Hammy does such a great job of winking. Oh, how it looks like you have been having a bushel (pun intended) of fun while away. I love the theme, hopefully I can play along as we will be traveling soon. I do love the apples, and it is amazing how each color shows up differently as to the winking and glossing. Cool. What an amazing group of women to meet up with. When I read where you were before seeing the faces I had hoped you would get to meet up with Michele. And to see Anita there too...wow. How fun! Enjoy yourself. Love your twofer cards, very nice. Looks like you are having a wonderful time with crafting friends, enjoy. 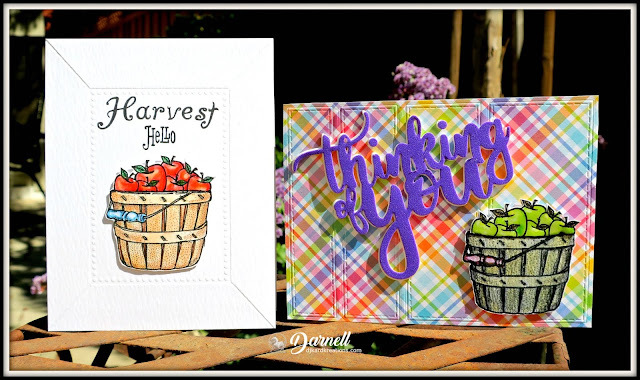 Two gorgeous cards Darnell, I love the tub of apples image and you've coloured them up beautifully. Both cards a fabulously designed. Love apple season! It will be a fun challenge. Your reunion will be a blast. I remember meeting with you and seeing some of these gals when you were in MN. Too long ago! D, the pleasure was all ours! What a fun day - thanks for inviting us, for the belly laughs, and wonderful eats, too! Wonderful cards! Love them a bushel, or a peck? Great fall cards with your basket of apples. I love that picture frame such an amazing way to frame your image and those glossy accents make those apples so perfect to eat. Oh, Darnell. Loved reading this blog post and seeing the lovely cards. 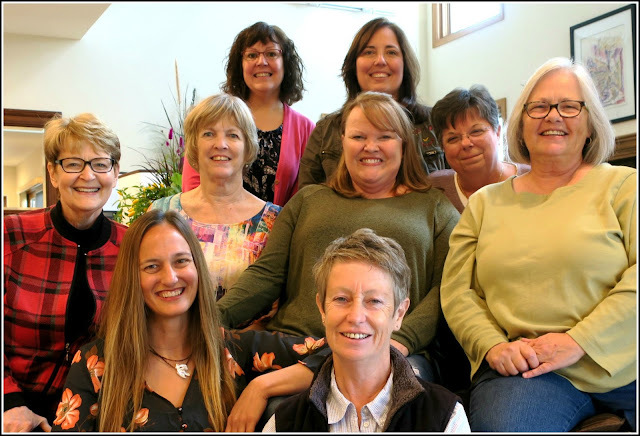 I especially enjoyed seeing picture of a group of card makers getting together. I only wish/pray that I could find women interested in doing this here in the UP of Michigan. It would be so much fun. Sometimes it's not always about the creating new cards together. 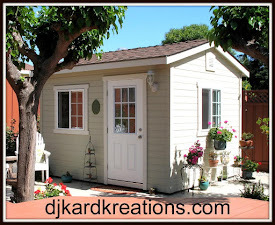 It's about the friendships...sharing a wonderful, creative hobby with like minds...and enjoying life together. Glad you could all do this. And I do plan to check out these other girls' blogs. Thanks so much for sharing your creations with us. It inspires me so much! Terrific cards for fall but, what I really love, is seeing all those happy crafters in one place. The only problem I see is that jaws must be flapping so much that very little crafting will be accomplished. I know if I were there that's what would be happening. Both are beautiful cards in warm colours Darnell. I love your polished apples LOL. Enjoy your crafting on the lake. Apples with sparkle or with shine, how to choose! They are both great cards. First of all, I love the photo of all of you, looks like a lovely group of ladies. So pleased you had some special time with your sisters too. What fantastic cards Darnell, I enjoy seeing your twofers, it is so much fun to see various ways to use one stamp. these cards are wonderful ! Hey Darnell!!! Ooh what fun it looks like you are having!! Color me a tiny bit green getting to have so much crafty fun with friends!! This is an awesome 2-fer challenge! 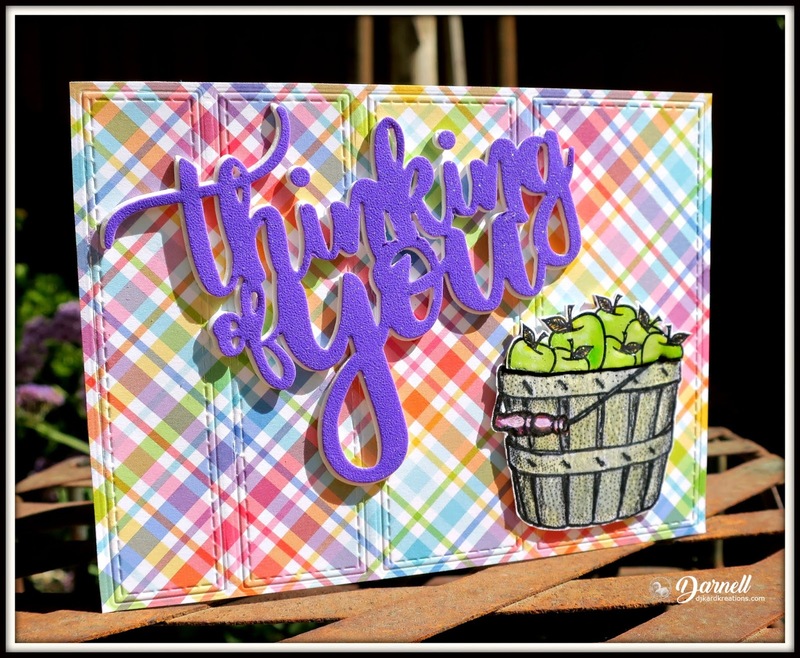 I love your bushel basket cards! Especially the first with it so beautifully framed out! Happy travel, have fun and hugs!!!! Your baskets full of glossy, sparkling apples look so delicious be it in red or green with a white frame or pretty plaid paper! Yum! 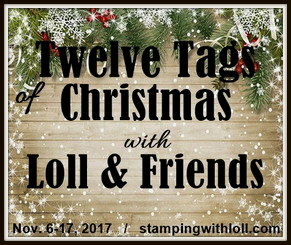 You must have such fun getting together with all these lovely stampers! Enjoy the rest of the week! One as crisp and fresh as an autumn apple and the other as bright and happy as you!! Love them both Darnell. What a wonderful photo of all you gals, bet you had loads of fun!! Oh wow...at the lake...that sounds like super fun! Enjoy the days with those fine crafters!! Fabulous both, Darnell! Love the elegant look of your CAS and the plaid one is just delightful, such sweet look!! Oh what gorgeous cards Darnell, and so very different!! Good to know that Hammy has been busy making all things (apples) scmarkly! Is he enjoying all the travel - if he is travelling I am sure he has charmed all your friends and family! What fun meeting up with all those talented ladies and getting to play... Fabulous photo! And two spectacular cards... I love the apples and their glossy coating and both designs are fabulous! I do remember you. :-) I'm in the same situation. Haven't write any post since September Twofer. Your basket with apples is a very propriate harvest motiv. Wonderful cards and a super nice colouring of red and green apples. What a nice photo at the end! I can feel good vibrations. Enjoy! I LOVE your baskets of apples, Dolly! When I was a kid we would go to the orchard and pick a bushel of apples and Mom would make the most delicious pies and sauce with them! What happy memories these cards evoke! Love the picture of you and all your friends together! What a great photo! I know you had a wonderful time! It looks like you all had a great time at the lake! I think it's so nice that you gals take the time to get together for some crafty time...sounds like heaven to me!!! Two beautiful cards with such lovely glossy apples so happy hammy added that effect. Looks like you are having a great time - enjoy! Beautiful cards. Love the bright cheery colours. Thanks for playing at AAA Cards. Off galavanting again? You do have fun! Beautiful, happy stamping sisters. Of course, your cards are beautiful and happy, too. I like how you combined the different stamps and how you always manage to give the old stuff some love. One card is very colorful, the other very clean. Your challenge prompt allows lots of possibilities! Two absolutely gorgeous cards Darnell! You're lucky to be able to get together with crafty friends and get inky! Those times are always the best, aren't they? So glad you're having a good time on your travels. Your cards are beautiful. Those sparkly apples look absolutely luscious! Enjoy the rest of your trip. I recognise some of those crafty faces! Those glossy red apples look good enough to eat Darnell and the bright dp on the second card looks wonderful! Hope you're having fun with your crafty buddies! What wonderful coloring and glossing on both of your harvest apple baskets Sis! Love both of your backgrounds - that plaid is so bright and fun along with the big purple sentiment! What a wonderful crafty visit you are having!! Two beautiful cards, Darnell ! I love your bushel of apples, they look so real ! Love the CAS look of the first card and how the red and glossy apples pop up on the white background. Speaking of background, I love this rainbow plaid. Those colours are so joyful and the purple sentiment matches so well. Another two fab cards Darnell. 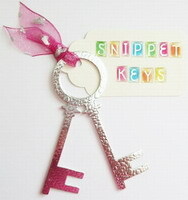 I’m so envious of your crafty get together! Looks like you’re having a great time! Who could resist those beautiful apples all shiny and twinkly! Both bushels are fantastic! Sorry for being so late at commenting, someone kept me laughing too much all last week - oh, it was you! I miss you already, but the good news is I can still hear your voice in my head, lol! Beautiful cards, I love your glossified apples. Two beautiful cards, those apples look good enough to eat. Your second card is just a lesson in design - I am in awe of the elements you combined together - it looks amazing. Hey Darnell! Talk about being MIA! My apologies for not being around much~lots going on, but hope to catch up sooooon. Love this Twofer of your sweet bushel of glossy 'n schparkly apples. PS: The photo of you lovely ladies together put a big smile on my face! NO way! I am so jealous. Green with envy. You lucky ladies. I'm sure it was a blast. Did you go cow tipping while in Iowa? You are on everyone's invitation list & I bet you've met more crafty friends in person than anyone else! So sorry we weren't in Iowa at the same time, but glad you had time with your sisters. I can only imagine all the fun at the lake! So neat to see what totally different looks you got using the same stamp--especially love the first beautifully CAS card!